Two Gayle Greve Hunt School of Nursing (GGHSON) alumni — Anna Ornelas, B.S.N., R.N., and Kuan Wong, B.S.N., R.N. — were recently recognized by the DAISY Foundation for their extraordinary service as nurses. The DAISY Foundation was created in 2009 by the Barnes family in honor of Patrick (aka “Pat”) Barnes, who, after being hospitalized with a terminal autoimmune disease, received exceptional care and attention from his hospital’s nursing team. The family was so affected by the nurses’ dedication that they founded DAISY in his memory, and created the DAISY Award for Extraordinary Nurses to honor and recognize nurses for exceptional work. Ornelas is a proud El Paso native, so serving the community she loves was a natural career path. 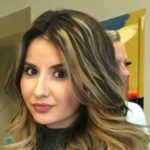 Ornelas graduated from the GGHSON in 2014 and went on to complete her residency at University Medical Center of El Paso (UMC); she has since wasted no time in making her mark on the nursing profession. As an R.N. in UMC’s surgical department, Ornelas recognizes the value of building trust with her patients. “I like to remind patients that they are doing their part seeking medical attention and taking care of their health,” she said. She is also a firm believer in communicating what she is doing and why, which helps build trust between patients and their health care teams. In the level 1 trauma center where she works, Ornelas regularly cares for patients who have suffered severe automotive or motorcycle accidents. One such case, she recalls, was a patient with a traumatic brain injury. Although by and large unresponsive, Ornelas felt a strong connection with this patient — as if he could sense her and knew she was there to help him. With the support and attention of Ornelas and others on his health care team, the patient eventually made a full recovery. Ornelas credits the GGHSON faculty — especially Jacqueline McCoy, D.N.P., R.N., FNP-BC — for teaching her the importance of taking an individualized approach to caring for each unique patient. 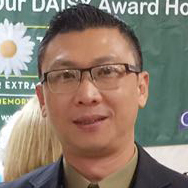 Like Ornelas, Wong completed his nursing degree in 2014. Originally from Malaysia, it took a move across the Pacific and several jobs — including working as a professional chef for over a decade — for Wong to find his true calling. Now, he finds satisfaction in building rapport with his patients and their families. Wong was nominated for the DAISY Award based on the high level of attention he gives to his patients; he has been known to check in on them every hour and always greets everyone with a smile. Wong thanks the GGHSON and the comprehensive learning environment offered by the school for preparing him to become the best nurse he could be. He is now practicing at El Paso’s own Del Sol Medical Center.